Not only did Elizabeth Jones of Montana State University (on left) win the individual open reining division at the Hamburg, New York Semifinal last March she even went to the same high school as long-time Minnesota Twins batting star Joe Mauer! 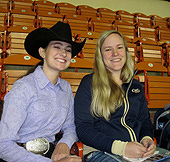 From St. Paul, Minnesota, Jones is seen here with head coach Megan McGrade in the stands of the Pennsylvania Farm Show Complex before riding in the same division at IHSA Nationals on May 5th. In 2017-18 there were not enough Hunter Seat Riders in Region 3 to make the region "Legal" for English competitions so hunter seat riders spent the second half of the season traveling east to compete in Zone 7, Region 3 shows. Only one Hunter Seat rider from Region 3 competed in a Zones show. Emily Csnenar of Montana State (not pictured, and we apologize if the spelling of her last name was not relayed to us correctly) was fifth in individual walk-trot-canter at Zone 7 Zones in Springfield, Missouri last April 8th, making her the only Region 3 hunter seat rider to survive Regionals. It seems Codi Uecker of Rocky Mountain College (pictured) always has her photo on our Zone 8, Region 3 page. From Lewistown, Montana, Uecker won the individual open western horsemanship division at 2018 IHSA Nationals in Harrisburg, Pennsylvania (she also won the division at the Hamburg, New York Semifinal to qualify) on May 4th. However this photo is from two days later when Uecker competed in the reining phase of the individual AQHA High Point Open Rider competition. 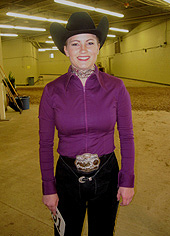 Uecker would finish her junior year by placing tenth overall in the AQHA on May 6th. Click on the map to get information and results from IHSA shows. Schools competing in Zone 8, Region 3 during the 2018-2019 school year: Montana State University at Bozeman, Rocky Mountain College, University of Montana Western and Utah State University. Show Schedule subject to change.